Up until last week, KG would have been placed with the power forwards, but with the injury to Jermaine O’Neal, KG has been moved to center and thrived. KG doesn’t have the quickness that he used to in his prime but understands maybe better than anyone else in the NBA how to use his body defensively and to be in the right position. Positives: By all accounts KG, has not Pierce or Rondo has been the Celtics best player this season. He has the highest PER on the team as well as the best +/-. As I said up above, KG just understands the game. He is still quicker than most centers and gets to good position defensively and the five game win streak was correlated to KG being switched to center. His jumper from outside is still pure as ever. He stretches the floor just like Bass does, and allows room for Rondo, Ray, and Paul to drive the lane. 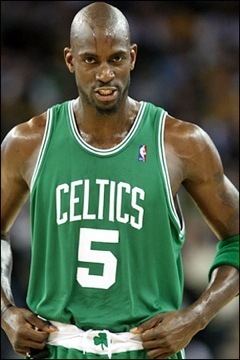 He is still the heart of the Celtics and he brings the intensity to every single game. Last season according to Synergy, KG was the second best defensive power forward in the game, behind Taj Gibson. Negatives: He has lost the quickness and the ability to jump that he had as a youngster and it shows on both the offensive and defensive ends of the floor. Quicker players just go right by him as he helplessly looks on. Also, KG doesn’t seem to want or feel the need to box out. If he stuck a body on some players he would have saved at least 30 offensive rebounds this season for the Celtics. His knees are also a constant worry for the Celtics and his minutes need to be monitored. Positives: Jermaine O’Neal is the rare NBA player who has completely transformed his game. Long gone is the high-flying center that would sky for dunks on one end and have highlight reel blocks on the other. He still blocks shots now, but it is completely due to his great positioning and timing instead of athletic ability. He is also the rare player who has the ability to not only block shots, but be in position to take charges. Before his injury Jermaine was up and away leading the NBA in charges taken this year. He is also one of the Celtics best rebounders and provides much needed big man depth for the team. Negatives: His offensive game has much to be desired. He has a decent 10-15 foot jumper, but outside of that, does not bring much else to the table. He is constantly hurt and his latest wrist injury, may keep him out for the rest of the season. Poor guy, because his body just doesn’t seem to be able to hold up anymore. On top of the wrist, his knees are farther gone than KG’s. Due to the uncertainty with his wrist for the rest of the season. The Celtics may look to cut Jermaine O’Neal to open up space to sign another big man for the playoff run. They also were looking to trade his expiring contract. While I love Jermaine and his passion, I am not sure that the Celtics are going to have him on the roster past this season. Positives: The steamer has been a fun player to watch this year. Burdened with big expectations after a big preseason, Stiemsma has played well in some situations and looked lost in others. He is averaging almost a block every 9 minutes and has shown great defensive ability. He also has a better than expected 10-15 foot jump shot that he’ll hit every once in a while. Negatives: He is not always ready to play and will sometimes just look lost or confused out there. He takes chances defensively going for the big block and can look silly out there. Other than a few jumpers, he is extremely limited offensively and has terrible hands. You gotta love the steamer though. This entry was posted in Celtics and tagged boston celtics, boston sports blog, celtics, Centers, ESPN, Grades, greg stiemsma, Jermaine O'Neal, kevin garnett, Knee Injury, Synergy Sports, Wrist, wrist injury by leibo4. Bookmark the permalink.